Every day in the life of India is made of up cricket, Bollywood, and politics. Yes, there are fans of Breaking Bad and Netflix but a large part of the population is content with what these three industries offer to them regularly. This combined with the growing Internet demographics, India is fast becoming a force to reckon with in the digital world. The second-largest online market worldwide, India still has an untapped potential of Internet waiting to unleash. Statista reported that in 2018, India had 483 million internet users. This figure is projected to grow to 666.4 million internet users in 2023. So how does this large Indian internet population spend its time on the web? This population watches videos, plays games online or engages in educational content. This demographic does most of its online activity on its smartphone. - India is home to one-tenth of the world’s gamers. - Almost 76.2% online Indian gamers are most likely to wager on cricket. The above table showcases the tremendous potential of Indian internet users and how this market is ready to embrace good online content centered around subjects that are most important to the population. By 2020, the Indian gaming industry is slated to be worth $1.1 billion (Rs 7,700 crore) and the count of gamers will rise to 628 million from under 200 million in 2015. With close to 500 million internet users, Indian brands must target this demographic who can become brand advocates for offline buyers. This demographic is keen on trying out new things on the internet – be it videos or games. 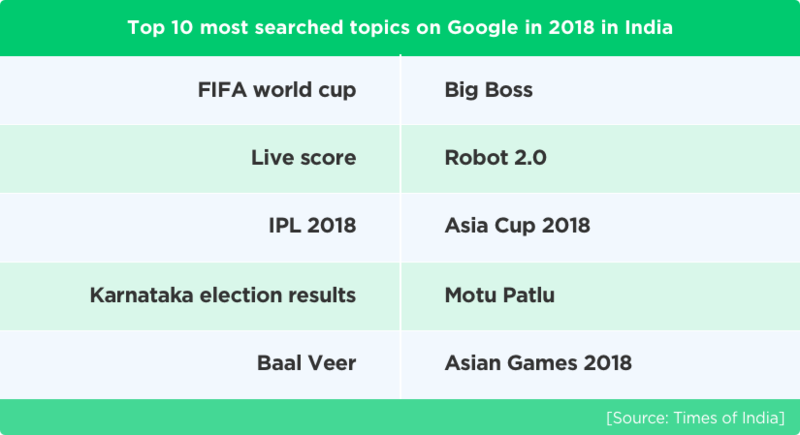 These are the three top content subjects for the Indian demographic today. Indian Premier League ensures that cricket is on the minds of the people throughout the year while 90% of cricket fans worldwide reside in India. Similarly, Bollywood is the 2nd most watched subject on YouTube content after educational videos. At the same time, millennials and Gen-X follow at least one politics related page on Facebook on average. If brands focus their promotion strategy around these three subject matters, they can win at all levels. A majority of internet users are mobile-only users, they don’t necessarily have laptops or computers. This is the new-age India that swears by smartphones. Indian brands and companies that wish to achieve deep customer engagement must think mobile first. They can create greater customer experiences through mobile applications and online engagement platforms. Every Indian home discusses politics, cricket, and films – these are omnipresent and popular themes. When combined on one online platform, these topics have the power to attract, sustain and engage users on a long-term basis. The platform offers a plethora of opportunities of winning, losing and trying again. This is a great chance for your brand to be noticed and remembered. Now there are double the opportunities of up-selling when customers are continually engaged in a gaming environment. The above possibilities help your customers become attached to your products or services. Chances are they will come back for more. You can start with an online fantasy sports software solution which would be a combination of fantasy cricket app development, political fantasy software, and fantasy gaming on Bollywood movies. This platform can offer fantasy games around these three where users can play these games, win cash prizes or merchandise while the brand that built the platform can engage in promotion of its own products or services to these users. You can offer daily or season-long games. Some of the world’s biggest viral content websites such as Buzzfeed or Trendsworthy use predictions and quizzes to keep visitors on their websites. These are some of the top trends online where users get to challenge themselves and get rewarded in exchange for answering questions, taking guesses and quizzes. 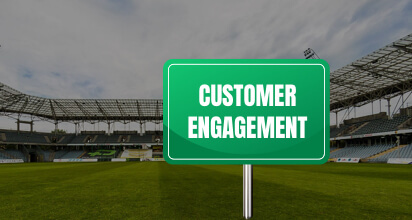 Your customer engagement platform can offer interesting quizzes around politics or Bollywood or prediction questions around IPL 2019 or the ICC Cricket World Cup 2019. If brands choose to offer free games on such a platform, they are free from any legal restrictions or processes. They can simply offer a free platform where people earn money or gifts related to certain brands. You can offer gift vouchers to shop, discount coupons upon winning or digital currency or digital wallets to be used to purchase your products or services. 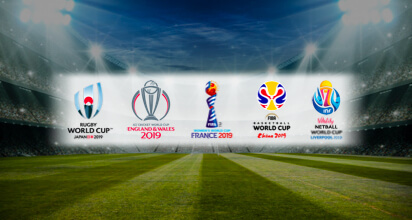 Vinfotech is the world’s leading fantasy sports app development company that has built interesting platforms across industries. We have consulted our clients over increasing their customer engagement through strategy-focused gamification. We believe anything under the sun can be gamified and any kinds of customers can be engaged in gaming platforms. Reach out to us for your customer engagement platform development. Give us a call.